A giant inflatable figure depicting Donald Trump as a baby will fly over London during his visit later this month. London Mayor Sadiq Khan gave permission for the balloon to fly after thousands of people signed a petition and donated to a crowdfunding campaign. The mayor struck a deal with the campaign group, and strict rules are in place for the flight from Parliament Square Gardens, with the balloon being tethered to the ground and restricted from floating higher than 30m, as Sky reports. The balloon is six metres tall and depicts Trump as a giant baby in a nappy. The balloon will take flight between 9.30am and 11.30am on Friday, July 13, during Trump’s visit. The inflatable will coincide with a ‘Stop Trump’ march in central London. The Mayor supports the right to peaceful protest and understands that this can take many different forms. His city operations team have met with the organisers and have given them permission to use Parliament Square Garden as a grounding point for the blimp. We didn’t get off to the best start with the Mayor’s office over this, who originally told us that they didn’t recognise Trump Baby as legitimate protest. But following a huge groundswell of public support for our plan, it looks like City Hall has rediscovered its sense of humour. Trump Baby will fly! So far, a petition to let the balloon fly has received over 10,000 signatures, and the Crowdfunder site has raised over £21,000. He really seems to hate it when people make fun of him. So when Trump visits the UK on Friday the 13th of July this year, we want to make sure he knows that all of Britain is looking down on him and laughing at him. That’s why a group of us have chipped in and raised enough money to have a 6 meter high blimp made by a professional inflatables company, to be flown in the skies over Parliament Square during Trump’s visit. Perhaps unsurprisingly, former UKIP leader Nigel Farage was not pleased with the plans to protest his pal’s visit to the capital. Sadiq Khan has allowed an inflatable “Trump baby” blimp to fly in London. This is the biggest insult to a sitting US President ever. However, the inflatable Trump plan received so much support that the organisers have now planned to take their effigy further afield after the President’s trip to London. People have have been SO generous and supportive that we now have WAY more money than we can sensibly spend just on Trump’s UK visit in July! So – Trump Baby is going on World Tour! All the details are still TBC but once little Donald has been run out of Britain in July, we will start to put together an itinerary – so if your community is unlucky enough to be expecting a visit [from Trump] please get in touch after the 14th. 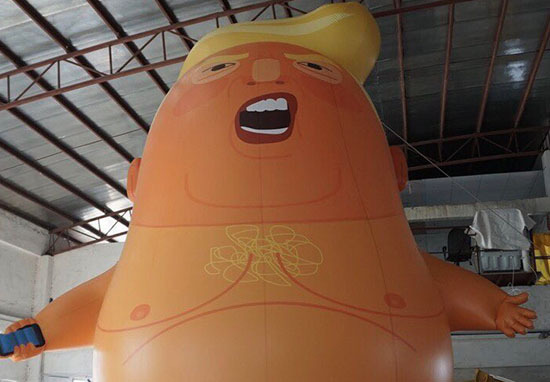 The inflatable Baby Trump will be flying over London on Friday, July 13, from 9.30am to 11.30am.